The Staff Selection Commission (SSC) is an organisation that works under the government of India to recruit staff for various posts in the various ministries and departments and in subordinate offices. The commission also conducts examinations for the recruitment in various departments of the state. For any query related to examination, all the candidates are advised to check the official notification. Candidates should possess Bachelor’s Degree from a recognized University or Institute for Post No. 01 to 22 & 24 to 32 and Bachelor’s Degree in any subject from a recognized University or Institute with at least 60% Marks in Mathematics at 12th standard level or Bachelor’s Degree in any subject with Statistics as one of the subjects at degree level for Post No. 23 with relevant experience. Candidates age limit should be not exceeding 30 years (He/ she must have been born not earlier than 02-08-1987 and not later than 01-08-1999) for Post No. 01, 02, 04, 10, 12, 13, 16, 17 & 20, between 20 - 30 years (He/ she must have been born not earlier than 02-08-1987 and not later than 01-08-1997) for Post No. 03, 05 to 07, 09 & 18 and 18 – 27 years (He/ she must have been born not earlier than 02-08-1990 and not later than 01-08-1999) for Post No. 08, 11, 14, 15 & 19 as on 01-08-2017. For more age details refer the notification. Age relaxation is applicable to 05 years for SC/ ST candidates, 03 years for OBC, 10 years for PH, 13 years for PH + OBC and 15 years for PH + SC/ ST candidates. For more relaxation details refer the notification. Candidates will be selected based on Computer Based Examination, Descriptive Test, Skill Test, Documents Verification & Interview. SSC CGL 2017 will be a computer based test which will have 100 questions of objective nature. The total time duration allotted is one hour. There will be four sections in the test - General Intelligence Reasoning, General Awareness, Quantitative Aptitude, English Comprehension. Each section will have 25 questions. Each question will carry 2 marks, which means that the test will carry total 200 marks. Candidates who qualify Tier I will then appear in Tier II which will also be a computer-based test. Candidates should pay Rs. 100/- through SBI Challan/ SBI Net banking or through credit/ debit cards of any bank. Eligible candidates may apply online through the website www.ssconline.nic.in from 16-05-2017 to 16-06-2017 by 05:00 PM. 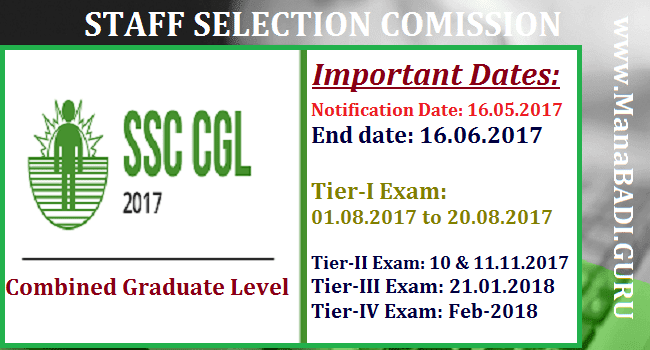 The official link to apply online for SSC CGL 2017 will be activated tomorrow. The application form will be available at ssconline.nic.in. The application fee for all candidates is Rs. 100. Women candidates and candidates belonging to Scheduled Caste, Scheduled Tribe, Physically handicapped, and Ex-Servicemen are exempted from paying application fee for SSC CGL exam. Online registration for SSC CGL 2017 to begin today. Bringing an end to the long wait of aspirants, Staff Selection Commission (SSC) has finally released the official notification for Combined Graduate Level (CGL) 2017. The recruitment examination, which is conducted by the Commission for graduates has been the most awaited exams of the year. Online registration for SSC CGL 2017 will continue till 16 June 2017 for the Tier I exam. Considered to be one of the most sought after examinations, SSC CGL is held every year for filling up different categories of posts in various Ministries/ Departments/ Organisations. #The selection process is likely to be completed by February- March 2018. #Women candidates and candidates belonging to Scheduled Caste, Scheduled Tribe, Physically Handicapped, and Ex-Servicemen eligible for reservation are exempted from paying application fee. #For others the application fee is Rs. 100. #Tier 1 and 2 will be computer based and Tier 3 will be in pen and paper mode. Tier 4 will be a skill test/ computer proficiency test. #Last Date to Apply Online & Generation of Challan: 16-06-2017 by 05:00 PM.